Orchid-Star's 3 core members - Pete Ardron (kbds), Myo (vocals) and Pierre Luigi (guitar & bass) - perform on their own or with up to 7 (adding fiddle, brass, percussion and dancer) or sometimes more. 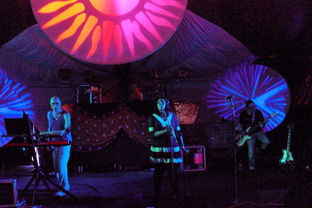 The band was formed in 2005 by Pete - initially to perform music written for chill-out DJ sets. His previous band Glow was well-known on the UK global-dance scene in the late '90s and he has worked on projects with Afro Celt Sound System and N'Faly Kouyaté. The band steadily took on its own identity and direction as the members brought their own personalities to the sound and their 2011 album 'Faster' saw them embracing the dance-floor following the sublimely chilled-but-beaty experience of their 2008 release 'Birth'. The music remains lush and colourful, atmospheric and visually charged throughout - a succession of spiritual, geographical, temporal and emotional journeys. Imagine the colours of World (Indian, Arabic, African, Celtic, Balkan, Balinese), psychedelic, and turn-of-the-20th-century Classical music over an engine of Funk, DnB, Trance, Progressive, Latin, Breakbeat and assorted downtempo grooves.